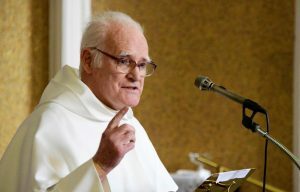 A campaigner seeking to keep the Dominican order in Drogheda has praised the Augustinian community for the way they are tackling the issues that threatens their future in the town. Last week, over 90 people attended a meeting entitled ‘Sharing of Ideas’ held by the Augustinian Order in the Westcourt Hotel in the Co Louth town. The meeting was held in order to discuss the rapidly changing circumstances of the Irish Augustinians and people were given the chance to voice their opinions and views on things such as what they liked about the church and what they would like to see in the future. Fr Colm O’Mahoney from the Augustinians said that it was important for people to know that the Augustinian church “isn’t closing and that this meeting was just in preparation for the next 5 or 10 years because now is the time to do something while all friars are still active, rather than wait until some have gone into retirement and the order is being stretched”. Speaking to the Drogheda Independent this week, Fr Jim Donleavy who is campaigning to keep the Dominican presence in Drogheda praised the Augustinians for their approach. “The Augustinian community are facing it head on with a discussion meeting and then forming a committee to see what the future holds for them and how best to move forward,” he said. Last year a petition was handed in to the Dominican Order’s headquarters in Tallaght signed by over 20,000 people from Drogheda who want to see the town’s Dominican church stay open. Fr Donleavy said that the Dominican community meet in Tallaght in late August and more details of the plans for Drogheda may or may not be revealed then. Fr Donleavy also revealed that a special Mass to celebrate Drogheda’s links with the Dominicans dating back almost 800 years will take place on Sunday 17 July at noon at St Magdalen’s church in the town. “It will be a celebration of our town and the role the Dominican Order has played in it,” he said.